Metric - There's no right, there's no wrong, there's only popular opinion. Lead singer Emily Haines, of the Toronto based group Metric, takes a languid saunter across the stage to her keyboard at the beginning of the show. She's wearing silver leggings and a green glow-in-the-dark Love and Rockets t-shirt, because she says that she "can't rock the Barbra Streisand shirt" she also has. Then, Black Sheep, one of their new songs, explodes from the stage and immediately Emily is caught up in her own music. Fresh off the festival concert circuit, that took them all over the world, Metric is invading the States with a mini club tour to debut some new material due out in 2008. Of course they play some classic tunes, but the fun doesn't stop there. The ever energetic Emily takes time after some of the shows, while on this tour, to do some post concert DJ sets for fans. Metric's music speaks of disillusionment, yet has hope. In an age where people overanalyze their lives to the point of extremes, Metric's message is to stand up, take notice of your world, and then dance the night away. Emily, James Shaw (Guitar), Josh Winstead (Bass), and Joulse Scott-Key (Drums) blend their disillusionment quite well with the absurdity of things, and to try not to make too much sense of this senseless world. Sometimes you just have to shut up and dance. New songs like, The Hooks, and Stadium Love, were mixed with classics like Dead Disco, Combat Baby, and Monster Hospital. Midway through the show, Emily quietly whispered to the audience, "You on drugs?" I'm not sure if it was a question or a statement. 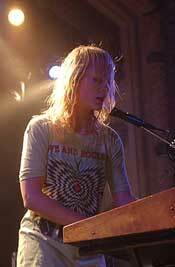 Emily's vocal styling is like beat poetry with a techno-rock pulse that gives homage to the band Sonic Youth. Music is her medicine and when lyrics can no longer convey the emotional content of the song she vocalizes ethereal tones, magic and mayhem all in one. You never really get a clear picture of Emily's face because tussles of blond locks sway across her face. 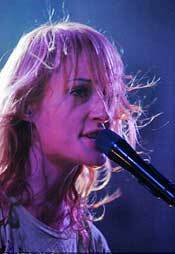 Her interlocking leg rhythm and head banging throughout the show, work out any angst that she may convey in her lyrics. In a way, a Metric concert is like a scene from 12 Monkeys . The lunatics are running the asylum, and having a great time doing it.